The power of maps to articulate a vision and raise $4.5 billion from Congress. In response to the events of 9/11 the Regional Plan Association and the Civic Alliance to Rebuild Downtown asked VanDam to visualize key transportation proposals for NYC and the region in film. 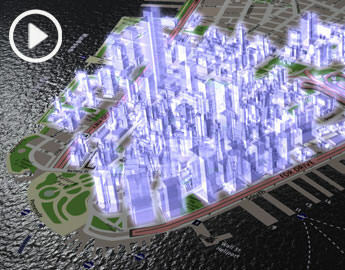 This 8.5 minute, animated movie focuses on why public transportation is a key ingredient in getting Manhattan out of its current crisis - it is the structural underpinning that enables the vertical city and is essential for economic development. The movie is meant to articulate a vision, stimulate public discussion and serve as a fund raising tool for Congress. This effort was crowned by success when (FEMA) the Federal Emergency Management Agency announced on 8/12/2002 that $4.5 billion appropriated by Congress in recovery monies could now be spent to build critical new infrastructure such as Fulton Central Station and the Battery Maritime Terminal.